Dr. Beacher was born in the Brighton Beach section of Brooklyn, New York in 1912. Soon after graduating from George Washington University, the U.S. Public Health Service sent the 25 year-old doctor to Alcatraz Island. He served as a medical officer from 1937 to 1938. Beacher later returned to Brooklyn and established a medical practice as a general practitioner (GP). Some years later, he became certified in dermatology and psychiatry. In addition to being a gifted physician, Beacher was a talented artist, woodworker, and inventor. He painted, practiced psychiatry, and created fantastic things until his death in 1993. Milton Daniel Beacher, M. D.
Pelican Island Publishing was established by Dianne Beacher Perfit in 2001. It was formed to publish, distribute and promote her father's book, which is now in its third printing! Dianne has written and edited technical training courses and computer software manuals for over 15 years. She periodically writes newspaper articles and performs freelance creative writing services for businesses and her community. Perfit earned a B.S. in Business Management and English from Rutgers University and has credits towards an M. A. in Corporate Communications. She is an avid gardener, hiker, and adventure traveler. She is also an eBay PowerSeller. On August 11-12, 2012, Dianne visited Alcatraz to celebrate the 78th anniversary of the prison's opening - as shown in the photo above. 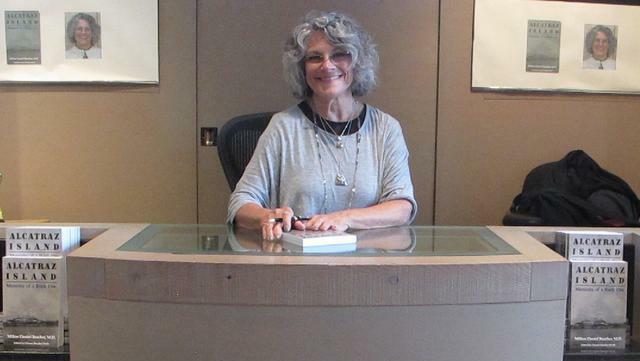 She signed books for visitors and elaborated on her father's experiences on the Rock. You can contact us via email at alcatrazdoc@gmail.com. Copyright 2001-2019 Pelican Island Publishing. All rights reserved.